Serious question: Is anything considered a taco if it all goes into a corn tortilla? Because if that’s the case, I have eaten A LOT of tacos, some typical and others not so obvious. And my son, even more than I have. Have I ever told you my idea for a book about feeding picky children? I would title it, “Finding Your Child’s Corn Tortilla.” This is because my son, aka Mr. Picky, loves corn tortillas and is much more likely to eat something if it’s in or with a corn tortilla. Eggs, steak, roasted carrots, whatever. The kid is probably the foremost expert on cutting edge taco combinations. 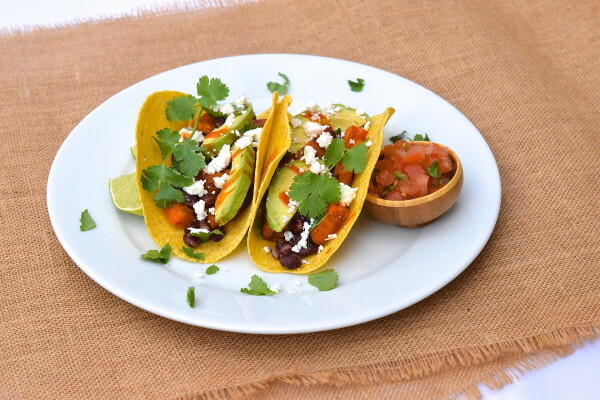 I, on the other hand, love corn tortillas for the same reason I love food in bowls — I love bringing all my foods together in one complete bite. 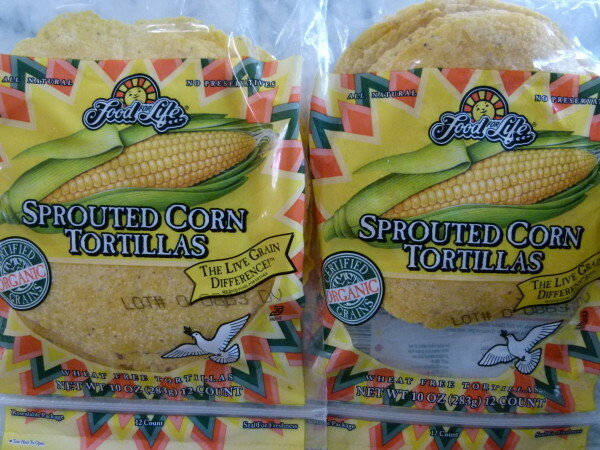 I have been buying sprouted worn tortillas by Food For Life for many years. Sprouted grains are more digestible and the nutrients more assimilable than non-sprouted. The texture isn’t exactly like standard corn tortillas, but I prefer the cornier flavor. But if I’m feeling like I need to eat a little more lightly, I will use a big lettuce leaf instead. 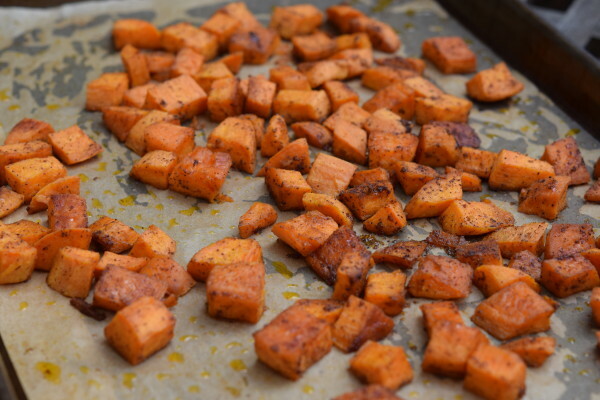 Although with this recipe, I have a hard time getting the sweet potatoes from the pan to my plate since I have been known to devour them straight from the baking sheet. You can even roast these as written for a simple side dish with roasted chicken or fish or put an egg on top. Sweet potatoes are loaded with caretenoids, fiber and Vitamin C. I think they could be classified as a super food. They’re much more nutrient-dense than regular potatoes. 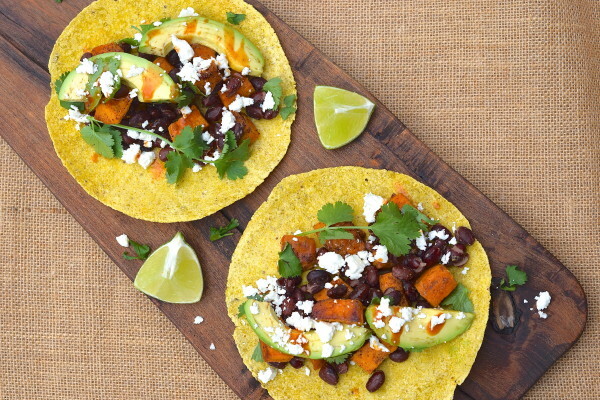 And they pair swimmingly with protein-rich legumes, whether it’s black beans or lentils. 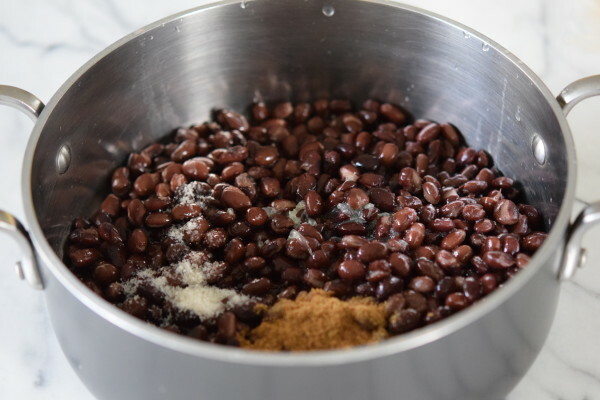 Here I just doctored up some cooked black beans with some tasty spices and lime juice to boost the flavor of the beans, but still kept everything quick and easy. I personally love to add hot sauce and cilantro to this mixture and my husband likes to add cheese of some sort. Avocado and/or radishes would also be great here. I originally taught this recipe a few years ago in my breakfast class as an alternative to typical breakfast fare. In a few classes, I served it with scrambled eggs and lots of hot sauce. A lot of my students have been telling me that they’ve been making breakfast for dinner lately and their kids love it. Great idea! In the same vein, why not make less complicated savory dishes for breakfast? I still don’t have my super bowl menu planned out, but if I do a taco bar, I will for sure have a platter with these sweet potatoes and black beans side by side for a vegetarian option. And I’ll stash away a little bit so I have some leftovers for a breakfast taco the next morning! Scrub, peel, and cube the potatoes into 1-inch cubes. If using sweet potatoes, melt coconut oil and combine with salt, chipotle powder, garlic powder, paprika, and chili powder. If using russet potatoes, combine olive oil with same spices. Toss the potatoes with oil-spice mixture. Place on a parchment-lined baking sheet and roast for 25-30 minutes, until tender and crispy. Meanwhile, place drained black beans into a saucepan. Combine with cumin, salt, and lime juice. Heat through. Warm tortillas on both sides on a griddle or skillet over medium heat, until pliable, about 1 minute total. Keep warmed tortillas in a thin kitchen towel. 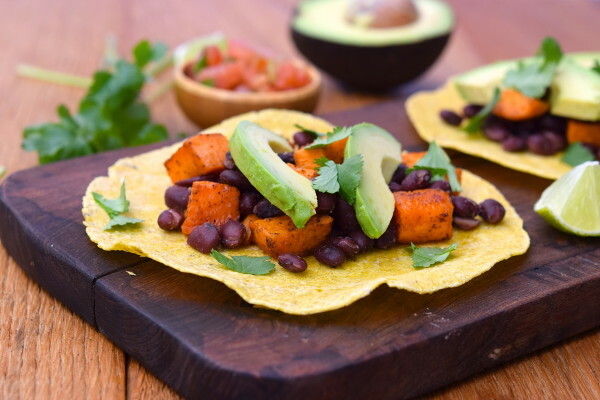 Serve potatoes and black beans with warmed tortillas and desired accompaniments. Hi, is cayenne a good sub if I don’t have chipoltle powder? Hi Brett! Not really. If you don’t have chipotle, you can take an equal amount smoked paprika plus a PINCH of cayenne. Cayenne is way hotter! If you don’t have smoked paprika, sub an equal amount regular paprika plus a pinch of cayenne, but you’ll miss out on the smoked flavor. I can’t wait to make this! I have recently discovered my love for sweet potatoes. 1 question: do I have to use coconut oil with sweet potatoes? Will it make a big difference? Does it taste like coconut? Thank you! Hi! We like him ;). You can use olive oil if you prefer. Coconut oil is more stable at higher temps, but go with the flavor you like better. I don’t think it tastes like coconut oil though. Just tried these last night. So delicious! Thank You! This is awesome and so delicious! Thank you Pamela. My girlfriend made this for us a month ago. Now its my turn to make it for her and my mom. Wish me luck! Nice! You’re going to do great since you already know what it’s supposed to taste like. Good luck! I finally got around to making these last night! So quick, so easy, so delish! I sprinkled a little cojita and cilantro and they were perfect! Thank you Pamela for another winner! Yay! Hooray for quick, easy and yummy!